"For what it’s worth, a key conclusion from the IMF’s new World Economic Outlook is that recessions caused by financial crisis typically end with export booms, with the trade balance improving,on average, by more than 3 percent of GDP. I find this a disturbing result: we’re now suffering from a global financial crisis, which means that the usual driver of recovery will only be available if we can find another planet to export to." With results still coming in, projections show the United Progressive Alliance is likely to win about 250 seats, making it a shoo-in to form the next government and provide continuity, a stable administration and progress on key economic and corporate reforms. Prime Minister Manmohan Singh’s electoral victory, the biggest any Indian politician has scored in two decades, may loosen political shackles that have restrained the country’s economic growth as it struggles to free half a billion people from poverty.....Political stability will make India a more attractive investment destination as Singh, 76, seeks the funds to stimulate Asia’s third largest economy. Many are called, but few are chosen, as the saying goes. But could it just be that this time around, and on a one-off, never to be repeated basis, India might find itself right there in the midst of things, with a 50-50 opportunity to add its name to that select and noble band, the chosen few. After all, someone has to lead the next global charge? The majority of the developed economies are either bogged down in the substantial quantities of debt that they desperately need to pay off, or weighted down by those elderly populations who are weakening consumption growth and leading to export dependence (Germany, Japan...). And as Krugman humorously points out, someone will have to add the extra demand which will allow global trade to start to grow again, so why should India not supply a significant part of this new demand, after all we are more likely to find consumers in India than we are on Mars. In fact, I may not be the only person around who believes this, since India's Sensitive stock index, or Sensex, surged 2,099.21 points to 14,272.63 first thing this (Monday) morning, posting a record 17 percent gain in a brief period of trading following the news of the election outcome, before the surge prompted exchanges to halt trading at 9:55 am, Mumbai time. Markets closed initially for 2 hours but the decision was then extended to include the rest of the trading day, the first time ever that this has happened to the Sensex. The stock index had previously climbed 23 percent so far this year while the Nifty Index was up by 24 percent. climbed 47 percent In fact since hitting "bottom" and closing at a three-year low on March 9, the Sensex had already risen by 47 percent while the rupee was up 4.4 percent in the same period. 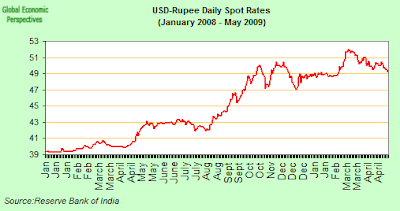 The rupee also powered up again toady, and jumped the most in two decades while bonds also rose. The reason for the surge is not a feeling of deep-seated admiration for the Singh government itself, but rather a sense of optimisim that it will give India the continuity and stability it needs to grasp the challenge before it with both hands. The rupee strengthened 3.1 percent, the most for a single day since March 1986, and closed at 47.92 per dollar at 5 p.m. in Mumbai. That took its gains this month to 4.5 percent, the best among the 10 most-active Asian currencies outside Japan. This contrasts sharply with today's performance by currencies in the more export dependent economies, with the Korean won falling 0.2 percent, Malaysia’s ringgit dropping 0.7 percent to 3.5750, and the Singapore dollar weakening by 0.2 percent. The reason for today's general fall was negative investor sentiment towards riskier assets following the Eurostat report last Friday that the EU economies contracted the most in at least 13 years in Q1. But why so much enthusiasm now? Certainly India's post independence growth record has been notoriously uneven, with growth rates up to the 1980s low and extremely volatile. 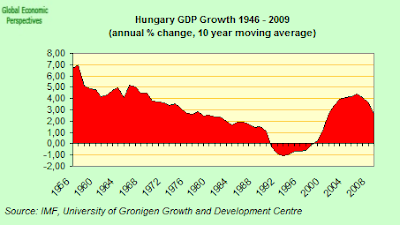 But then, in the 1980s and 1990s things started to change, economic reform began to get off the ground, tentatively at first, and more substantially later, while Inda's demographic profile started to improve, as the country faced the prospect of a steadily growing, healthier and better educated workforce. Post 2000 growth really started to take off - and has averaged around 7 percent since then. 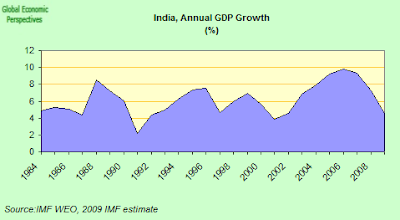 In 2007 the Indian economy maintained an impressive 9 per cent growth rate, despite the arrival of the sub-prime crisis (although not a few were talking of overheating, and "bubbles"), only then to drop back to a 7.3 percent rate in 2008, with the IMF are currently forecasting growth of 4.5 percent in 2009. Evidence of the recent slowdown in the Indian economy is now - like the ubiquitous IT technician - everywhere, but this, it should be stressed, is a "slowdown" and not an outright crisis of the kind we are seeing in many other countries. 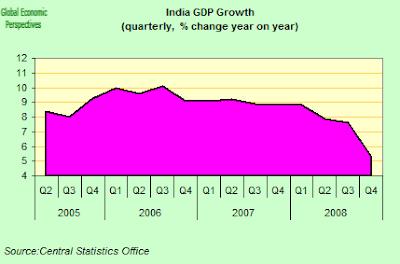 GDP growth slowed in Q4 2008 to 5.3 percent (from 7.6 percent in Q3), a serious development, but not an outright disaster. 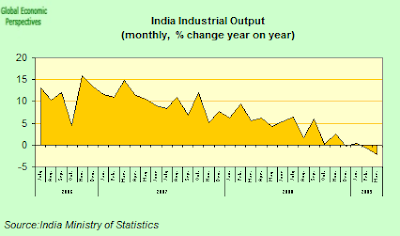 Industrial output also fell year on year by about 1 percent during the first three months of 2009, which compared to the 8.7 percent rise in the first quarter of 2008 was disturbing, eespecially since this is the first time we have seen a quarterly contraction in many years. 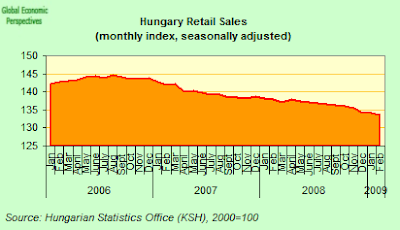 Money supply has remained rather more constant, and M3 growth to mid February 2009 was an annual 19.9 percent as compared to 21.6 percent growth last year, so the rate of increase has only eased marginally. 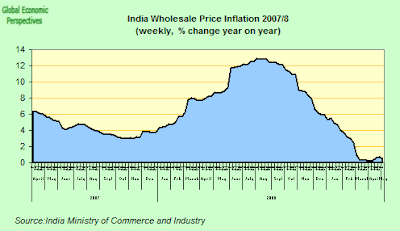 And in the meantime the annual rate of wholesale price inflation has fallen back strongly, hitting an estimated 0.48 percent at the start of May. But then, since money supply growth hasn't slackened that much, there has evidently been a significant weakening in internal demand (alongside the obvious fall in commodity prices). A number of fiscal stimulus packages have been put in place, and as a result the fiscal deficit from April 2008 to January 2009 was 174.3 per cent above that for the corresponding period a year earlier. The revenue deficit was up by 278 percent higher, indicating very strong pressures on the fiscal deficit and a significant departure from the The Fiscal Responsibility and Budget Management Act (FRBM). This surge in the fiscal deficit has been widely criticised, and Standard and Poor's reduced India’s rating outlook to negative from stable in February, citing the danger that “continued loose fiscal policy would result in a downgrade” in the country’s credit rating. In the meantime it affirmed India’s BBB- long-term credit rating, the lowest investment grade level. But there are reasons for optimism. As Duvvuri Subbarao (Governor of the Reserve Bank of India) argued in a speech - ‘India, Managing the Impact of the Global Financial Crisis’ - delivered to the Conference of Indian Industries on 26 March this year, the Indian economy has been spared the worst of the blast from the present crisis for two reasons. The Indian economy is still not sufficiently "open" to take a direct hit - only 15 percent of the Indian economy is export oriented - and Indian banks and financial corporations were relatively free of contamination from "toxic" instruments. Why Should We Expect A Ressurgence In Indian Growth? In order to understand what may happen next, perhaps the most import thing to grasp is what it was that just happened. In some ways a quick look at look at the Reuters/Jeffries CRB commodities index (see chart below) says it all. The chart - which shows the evolution of this index from the mid 1990s to date - immediately makes a number of important details about what has been going on incredibly clear. In the first place we can see how, after long languising idly around some sort of mean, a secular rise in commodity prices starts up around 2002 and last for around four years, eventually flattening out from between 2006 to mid 2007. 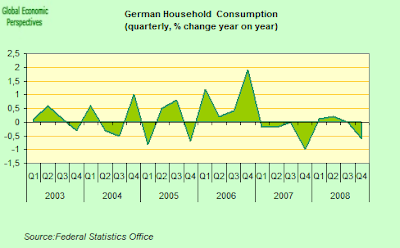 After this there was a further strong surge forward in the autumn of 2007 which lead to a sharp spike upwards. 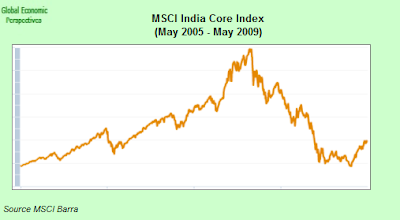 Basically, you could say (with the benefit of hindsight) that this period from August 2007 to July 2008 was the "overheating" period, as the growth crisis in the developed economies which followed the initial wave of "financial turbulence" in the US lead to massive inflows of funds into the BRIC and other emerging economies. This produced a sharp spike in commodity price inflation, and monetary tightening in one emerging economy after another. A desperate attempt to avoid the inevitable correction in the global economy which would follow the sub-prime "blow out" was "forcing" growth in the emerging economies at a rate they could not withstand (given global resource constraints), and the thing inevitably had to burst. Commodities peaked in July 2008, but the correction in the real economy only set in following the aftermath of the collapse of Lehman Brothers in October. 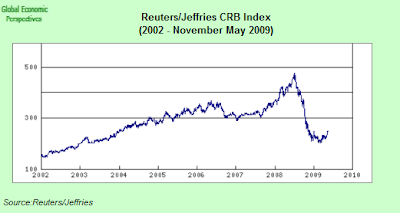 The Reuters Jeffries index hit an all-time series high of 473.518 on 2 July 2008, but was still stuck in the low 200s as we entered May 2009. So the real point I want to make about India's current growth slowdown is that it does not have "made in Delhi" written all over it, it is not the result of any inherent problem with the Indian economy as such. It is rather the local reflection of much more general problems at the global level, whereby the Indian economy was first accelerated and then half crashed. And this is precisely why I personally think the recent (and highly controversial) US bank stress tests were so important, not because of their significance from a US banking point ofview (which is what all the fuss was about), but because of the reassurance they can give market participants that we are not going to see another financial explosion in the United States (as opposed to a protracted recession, and slow recovery). Uncle Ben is thus underwriting the recovery in emergent economies like India and Brazil by offering the reassurance that investors need that there will not be another violent bout of instability. 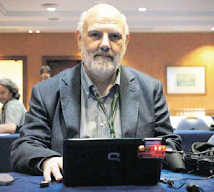 What India and Brazil now most need is for Ben Benanke to commit to mainaining US interest rates near zero for a sustained period of time, so that people can practice "carry" with a certain degree of confidence that things won't unwind, then, I think, we are up, up and away. So, on behalf of everyone concerned, thank you Ben. India’s inflation rate stayed under one percent for a ninth consecutive week at the start of May, giving the central bank a much needed margin to keep the current record-low interest rates in place and offering the outlook of inflation free economic growth for some time to come. With so much slack in the global economy, a sudden surge in commodity prices like the one we saw in the autumn of 2008 is most unlikely, and so, as they say, while the cat is away the mice can well and truly play. Wholesale prices rose a mere 0.48 percent year on year in the week to May 2 following a 0.70 percent increase in the previous week. Not everyone is convinced the outlook is so benign, and Reserve Bank of India Governor Duvvuri Subbarao said only last week policy makers need to begin to think about when they will begin reversing their expansionary steps. The current RBI forecast is for inflation to climb back towards 4 percent by March 31 as the economy gradually revives. Some evidence to support Subbarao's fears can be garnered from the evolution of consumer prices paid by industrial workers, which rose 9.63 percent in February from a year earlier, after gaining 10.45 percent the previous month, according to government data. 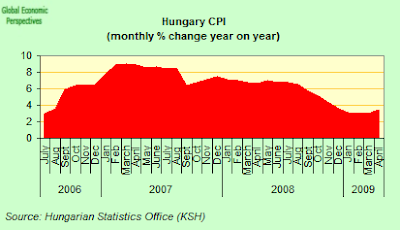 Consumer-price inflation for farm workers was 10.79 percent. India, in fact, has four consumer-price indices and as a result tends to rely on the wholesale price index as benchmark because since it is felt the consumer price indices don’t adequately capture the aggregate price. However, the disconnect between wholesale and consumer prices that we can see at this point can be more a reflection of the fall in commodity prices and the presence of excess capacity on the supply side, so the evolution of these indices needs to be carefully monitored. The RBI has now slashed borrowing costs six times in the past seven months, with the reverse repurchase rate being cut by a quarter-point to 3.25 percent as recently as April 21. This means the bank has now lowered the benchmark by 275 basis points since last October, while the repurchase rate has been reduced by 425 basis points over the same period to its current 4.75 percent level. And between now and September, the central bank is set to inject another 1.2 trillion rupees ($23.8 billion) into the banking system by purchasing government bonds via auctions and buying back market stabilization bonds, which were sold in the past four years to drain money from the economy. The injection is estimated to be the equivalent of a 3 percentage point reduction in the cash reserve ratio, according to the Reserve Bank. Subbarao’s optimism is also based on forecasts for this year’s monsoon rains - which look set to be normal. 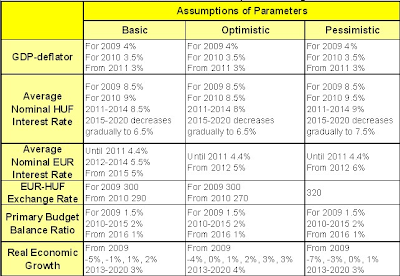 If this expectation is confirmed it will help sustain the unprecedented 4.3 percent average annual farm production growth recorded since 2005, boosting incomes for the three-fifths of India’s 1.2 billion people who depend on agriculture for their livelihood while keeping price inflation modest to feed to consumption of India's urban workforce. Sibbarao is also aware that India is much less vulnerable to the global economic slump than most of its neighbors since exports only constitute about a quarter of the economy, as compared with around a half for developing Asia as a whole. So India is less open, and while in general terms this would not be an advantage, during the current slump in world trade it is an evident plus. India’s industrial production fell the most in 16 years in March as the worst global recession since World War II hit demand for the country’s exports. Output at factories, utilities and mines declined 2.3 percent from a year earlier after a revised 0.7 percent drop in February. Production was dragged down in March by an 8.2 percent drop in capital-goods output (which does not bode well for short term investment), with all other categories showing improvement from February. Consumer durables production jumped 8.3 percent from a year earlier, the biggest increase in six months. In fact the (non seasonally corrected) output index was up in March over February, and substantially up from the lows registered in the last quarter of 2008. 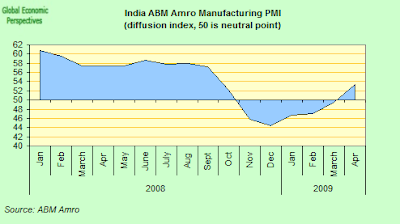 This impression is confirmed by the purchasing managers index, which in April gave the highest reading for the Indian headline manufacturing PMI in seven months. In fact the output index registered 53.3, a level above the 50 critical one separating growth from contraction. In fact the index has now steadily risen after hitting a trough of 44.4 in December. Just as encouraging, the new orders index rose to 54.9 from 49.5 in March. The return to growth was primarily driven by an improvement in domestic demand, according to the accompanying report. "Although the rise in new business came principally from the home market, there was also some, albeit slight, improvement in foreign demand for Indian manufactures," ABN Amro Bank said in the official release. Also worthy of note is the fact that along with the expansion Indian manufacturers noted renewed input price inflationary pressures. A combination of increased prices for some commodities and unfavourable exchange rates led to a moderate rise in input costs during April. This is the first time that input price inflation has been recorded in India's manufacturing sector since October last year. However continuing competitive pressures meant that manufacturers did not pass on their cost pressures on to customers, and factory gate prices were cut for the sixth straight month. However, the latest drop in average prices was the weakest in the current period of falling output prices. Employment levels across India’s manufacturing economy were little-changed during April with increased production requirements leading to recruitment on the one hand, while cost-cutting pressures produced job losses on the other. "The April PMI gives a very clear indication that business conditions in the manufacturing sector have improved significantly after a period of sharp contraction and gradual stabilisation. 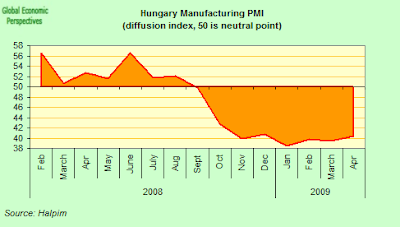 The headline PMI at 53.3 has signaled expansion in activity for the first time since October 2008. 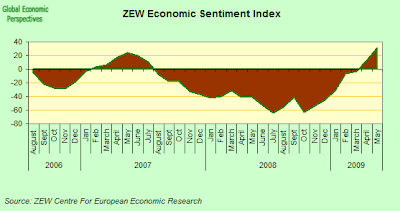 Moreover, the April reading is the strongest since October 2008," according to Gaurav Kapur, Senior Economist, India, with ABN Amro. "Survey data suggests that production was ramped up during April in order to cater to a pick-up demand and to build inventories. 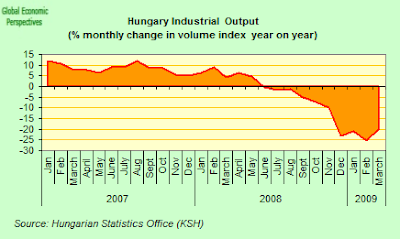 The output index printed at 55.7 for April compared to 49.3 in March, as new incoming business expanded during the month. The domestic orientation of the improvement in demand is clearly visible from the new orders index rising well above 50, even though external demand also improved modestly. New orders index printed at 54.9 as against 49.5 in March. This is critical as it suggests that domestic demand conditions are now strong and supportive for growth in the sector,"
Car sales and the production of cement, electricity and refined petroleum are also showing signs of recovery. India’s passenger car sales increased 4.2 percent in April from a year earlier, after a 1 percent gain in March. Cement production jumped 10.1 percent in March and electricity output rose 5.9 percent from a year ago, according to government data. But exports still remain weak, with shipments declining 33 percent in March from a year earlier, the biggest fall since at least April 1995.Goods exports dropped 33 percent from a year earlier to $11.5 billion last month, the government said in New Delhi today. That was the biggest fall since at least April 1995. 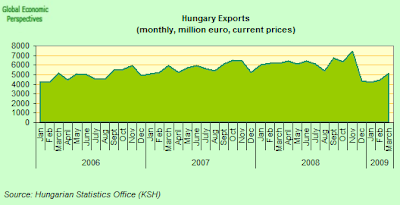 Exports slid 21.7 percent in February. 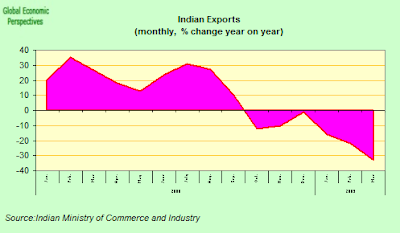 India’s exports, which account for about 15 percent of the economy, have been falling back recently, although they were still up by 3.4 percent (to $168.7 billion) in the fiscal year ended March 31. They did however fall well short of an initial $200 billion target set by the government before the September collapse of Lehman Brothers accelerated the world financial and economic slump. The government now expect exports to total $170 billion in the year that started April 1. The decline in exports is likely to continue until at least September, according to India’s Trade Secretary Gopal K. Pillai, while falling overseas sales may cost India about 10 million jobs, according to estimates from the Federation of Indian Export Organisations. Imports were also down in March - by an annual 34 percent - and as a result the trade deficit narrowed to $4.04 billion from $6.3 billion in March 2008. Oil imports plunged 58 percent to $3.8 billion, while non-oil imports dropped 19 percent to $11.75 billion. However, Subbarao argues, the Indian economy has globalized rapidly during the past few years. In terms of openness to international trade the ratio of exports plus imports to GDP increased from by more than 50 per cent in the 10 years from 1997–98 to 2007–08 (from 21.2 per cent of GDP to 34.7 per cent of GDP). Furthermore, the growth of financial integration has been even more rapid. During the same 10 year period (1997–98 to 2007–08) the ratio of total external transactions (gross current account flows plus gross capital account flows to GDP) increased by more than 100 per cent from 46.8 per cent in 1997–98 to 117.4 per cent in 2007–08. Furthermore, corporate borrowing from external sources has also increased significantly. 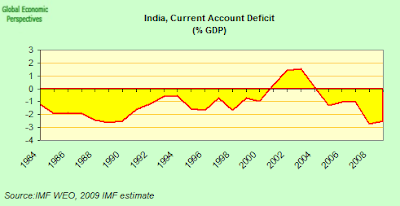 In 2007–08, for example, India received capital inflows to the extent of 9 per cent of GDP as against a current account deficit of 1.5 per cent of GDP. India has been facing the so-called twin deficit problem for some time now, and the poor fiscal record, together with the continuing high deficit is the main reason why international credit rating agencies have brought the country’s debt close to junk status. The fiscal problem is not an easy one - apart from running a general government fiscal deficit of a estimated 9.9 percent of GDP, the debt to GDP ratio is stubbornly stuck round the 80% level - far, far too high. Meanwhile, capital flows have continued to be vibrant despite the huge withdrawal of money from the stock market by foreign financial institutions, or FIIs. As a result, while India's foreign exchange reserves fell initially during the crisis, they have since stabilised, and are even now begining to show signs of increasing again (see chart below). At the start of this week India's Securities and Exchange Board of India reported that foreigners bought a net $828 million of local equities on May 13, the most since February 2008. Indeed they report that overseas funds have already bought a net $1.8 billion in Indian equities so far this month, well below the heady levels of 2007, but still a significant turnaround. Equally interesting is the change in the composition of the capital flows. FIIs withdrew an estimated $15.02 billion in 2008-09, according to Reserve Bank of India data. The scale and velocity of the withdrawal in the second half of last year certainly put significant pressure on India's money and foreign exchange markets - and short-term interest rates surged over 20% while the rupee tumbled to an all-time low of 52 against the dollar. But other types of capital inflows remained relatively strong, especially foreign direct investment, or FDI. Overseas Indians, too, sent a lot more money back home, due to the uncertainties created by the turbulence in the the developed economies and the higher interest rates on offer in India. Taken together, the measures put in place since mid-September 2008 have ensured that the Indian financial markets continue to function in an orderly manner. The cumulative amount of primary liquidity potentially available to the financial system through these measures is about Rs.390,000 crore (78 billion dollars) or 7 per cent of GDP. This sizeable easing has ensured a comfortable liquidity position starting mid-November 2008 as evidenced by a number of indicators such as the weighted average call money rate, the overnight money market rate and the yield on the 10-year benchmark government security. Commercial banks have responded to policy rate cuts by the Reserve Bank of India by reducing their benchmark prime lending rates. Bank credit has expanded too, but slower than last year. The RBI’s rough calculations show that, on balance, the overall flow of resources to the commercial sector is less than what it was last year indicating that even though bank credit has expanded, it has not fully offset the decline in non-bank flow of resources to the commercial sector. Of course, the present level of fiscal deficit is easy enough to justify, given the need to put a platform under the economy, and a number of stimulus packages have been announced by the Indian Government in response to the global financial crisis. Just one such measure - the decision of India's Sixth Pay Commission (which was not a stimulus measure as such, but rather the outcome of the routine policy process, and possibly highly political in view of the impending elections) was widely criticised, although the implementation in the short term may in fact have been timely. The Commission recommended across the board increases in salary for central government employees, to be followed in due course by comparable salary increases for state government employees. The payment was to be made in two installments, 40 percent (an estimated Rs. 1.57 trillion or roughly $31.4 billion) during 2008–09, with the remaining 60 percent coming due in 2009–10. The decision is, I say, deeply controversial, given the size of the deficit and accumulated government debt, but under the circumstances may well have served to place some sort of platform under domestic demand during times of global financial crisis. The stimulus packages per se have also come in two installments, The first one, announced in December 2008, was largely fiscal in its intent, and included additional expenditure of Rs.3 trillion ($60 billion) over four months, a cut of 4 percent in value-added tax, as well as a 2 percent export credit for labour intensive sectors and other export incentive schemes. 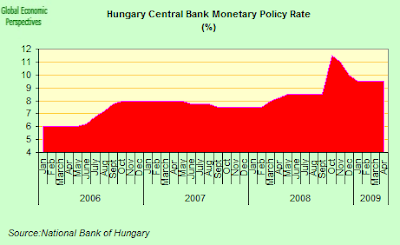 The second stimulus package - announced in January 2009 - was, in contrast, mainly montary and directed towards credit easing. Among the more important measures an SPV was created to provide liquidity support for investment grade paper to specific Non Banking Finance Companies (NBFCs). The scale of liquidity potentially available was Rs.25,000 crores/$50 billion. Public Sector Banks were to provide a line of credit to NBFCs specifically for purchase of commercial vehicles. 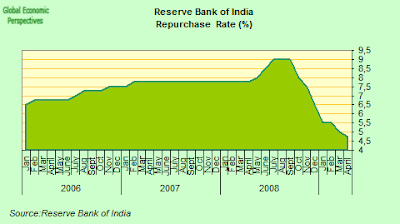 Credit targets of Public Sector Banks were revised upward to reflect the needs of the economy. Further the guarantee cover provided under the Credit Guarantee Scheme for loans to micro and small enterprises was increased from Rs 5 million to Rs 10 million with a guarantee cover of 50 per cent. In order to enhance flow of credit to micro enterprises, the government also decided to increase the guarantee cover available under the Credit Guarantee Fund Trust to 85 per cent for credit facilities of up to Rs 0.5 million. This measure should, in principle, benefit around 84 per cent of the total accounts accorded guarantee cover. The India Infrastructure Finance Company (IIFCL) was also authorized to raise Rs 10,000 crores ($20 billion) through tax free bonds by 31 March 2009 for refinancing bank lending of longer maturity to eligible infrastructure bid-based PPP projects. This would enable the funding of mainly highway and port projects to the value of about Rs 25,000crore ($50 billion). In addition, in order to provide funding for additional projects worth about Rs 75,000 crore ($150 billion), the IIFCL is now able to access an additional Rs 30,000 crores ($60 billion) via tax free bonds once the current year's allocation of funds has been used up. This surge in the fiscal deficit has been widely criticised, and Standard and Poor's reduced India’s rating outlook to negative from stable in February, citing the possibility that “continued loose fiscal policy would result in a downgrade” in the country’s credit rating. In the meantime it affirmed India’s BBB- long-term credit rating, the lowest investment grade level. S&P estimated that India’s national budget deficit, including off-budget items such as oil and fertilizer bonds and state government deficits, may increase to 11.4 percent in the year ending March 31 from 5.7 percent in the previous year. Only last week Fitch Ratings also reiterated that India needs to cut its budget deficit to avoid having its credit rating lowered. “India faces considerable challenges in balancing the need for short-term stimulus measures to counter the economic downturn and the necessity of re-establishing a sustainable medium-term path for the country’s public finances,” according to the agency statement. Fitch, which gives India a BBB- rating, its lowest investment grade, is worried that the new government may step up spending to soften the blow from slowing economic growth. If they do the ratings agency fears this will widen the general budget deficit to more than 10 percent of gross domestic product for the second year in a row in 2009-10. And these ratings matter, since they influence investor decisions as to whether or not to hold rupee denominated assets. It should be noted however, that the ratings agencies generally have responded well to the latest election result. Both S&P and Moody’s Investors Service, were both emphasising yesterday just how the outcome gives India's government a chance to improve its fiscal situation. As suggested throughout this post, the tailwinds behind the Indian economy are now incredibly favourable. A new government has just been elected which should provide stability to the country, and continuity in the realm of economic policy. The changing age structure of India’s population means that the proportion of the Indian population in the working age group (15–64 age bracket) is set to rise from 60.9 per cent in 2000 , to one which will surpass that if a developed economy like Japan by 2012, and continue to climb steadily to 66 per cent by 2030. But it isn't only quantity which is important here. Quality also matters. The nutritional status of India's population is improving rapidly, with calorie and other macro and micro nutrient deficiency on the decline. According to the 2001 Census, the literacy rate of India's population climbed from 51.54 percent in 1991 to 65.38 per cent in 2001. India will thus, in the years to come, find itself with a younger, healthier, better educated and thus more productive workforce than ever before. At the same time, the massive slack which exists in the global economy means that Indian now has a more-or-less unique opportunity to accelerate the development process at non-inflationary growth rates well above those which would have been envisaged only two or three years ago. At the same time, as the age structure has shifted, and the weight of child dependence has reduced, India's savings rate has risen steadily from 23.4 per cent of GDP in 2000–01 to 35.4 per cent in 2007–08. During the same period investment rose from 24 per cent of GDP to 36.3 per cent of GDP, suggesting the need for a slight current account deficit to cover the gap between savings and investment. And to return to where we started, on where the demand is going to come from to support the current global recovery. The IMF currently forecast a 2.5% of GDP current account deficit for Indian. Given the extent of investment that is needed in capital goods, technology and infrastructure this is a small, even benign, number, and at the end of the day will mean that Indian is once more playing its part in the community of nations, by adding a little extra net demand to the global pot.